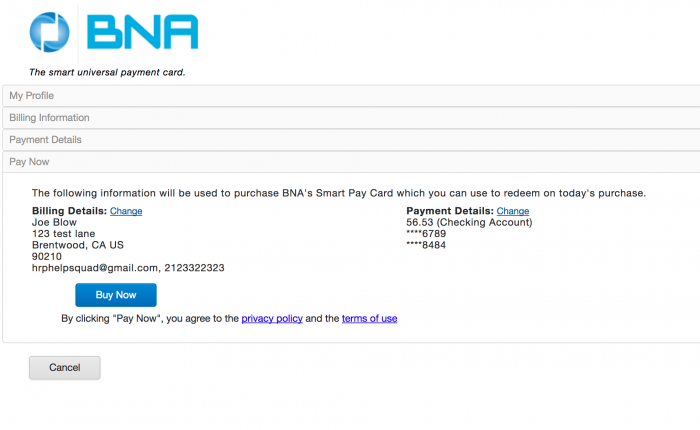 The following is a tutorial on how to purchase using BNA Smart Pay. 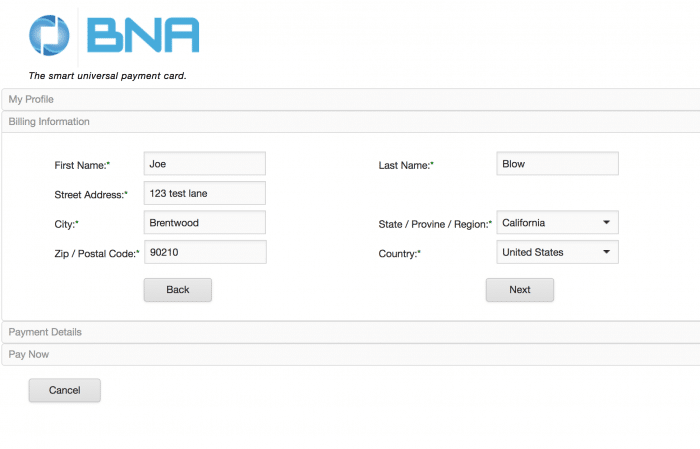 BNA Smart Pay allows you to pay with your bank account by using the information found on your check, or option number 2 is paying using American Express. 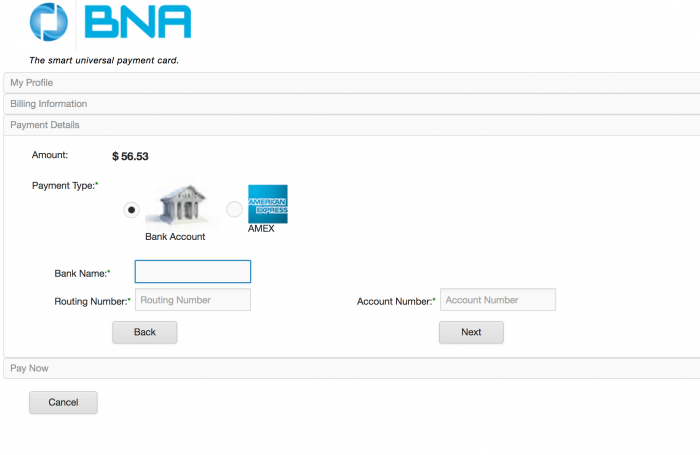 For more information about our banking partner, please visit their website BNA Payment Solution. 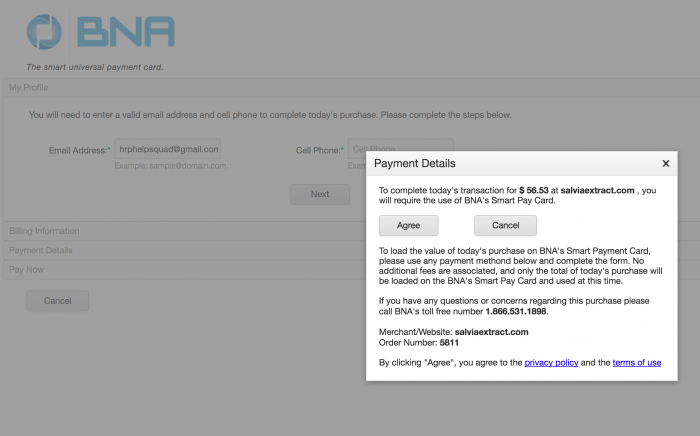 The next page will reroute you to the BNA Smart Payment page (hosted on an external page). Click on Agree to proceed further. If you have any questions, please feel free to call our banking provider at the number provided. At this point you are simply agreeing to pay for the purchase. The reference to BNA Smart Pay Card is referring to how funds are being given back to us, as you will not receive any Pay cards. Step 3 is fairly straightforward. Here you enter a valid e-mail address and contact phone number. No phone calls will be made to verify the purchase. 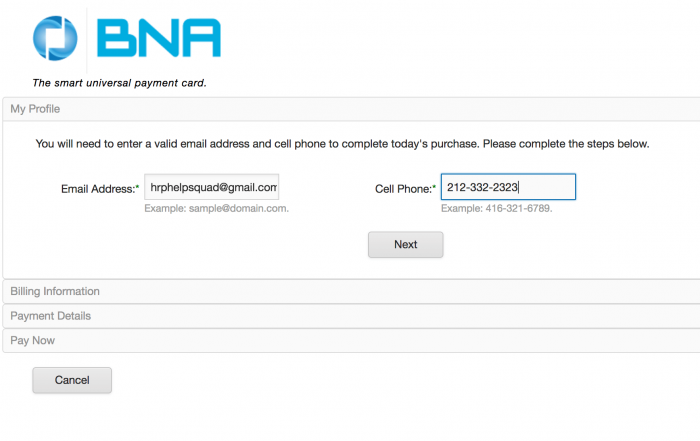 Its important that you enter a valid e-mail address in order to be able to complete Step 4. Your e-mail address should already be filled in based on what you entered on our site. 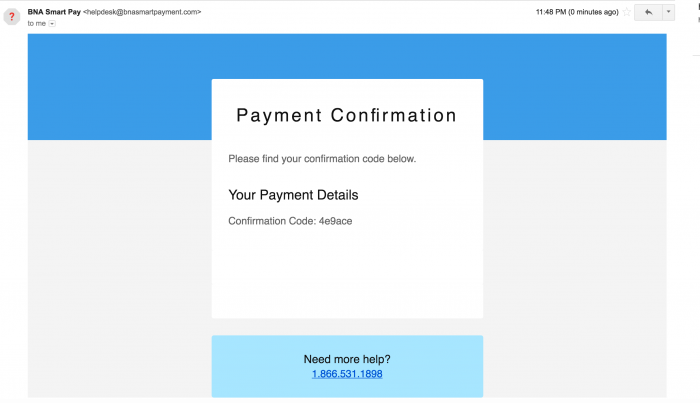 The confirmation Code has been e-mail to you. Once you retrieve it from the e-mail, enter it and click on verify. 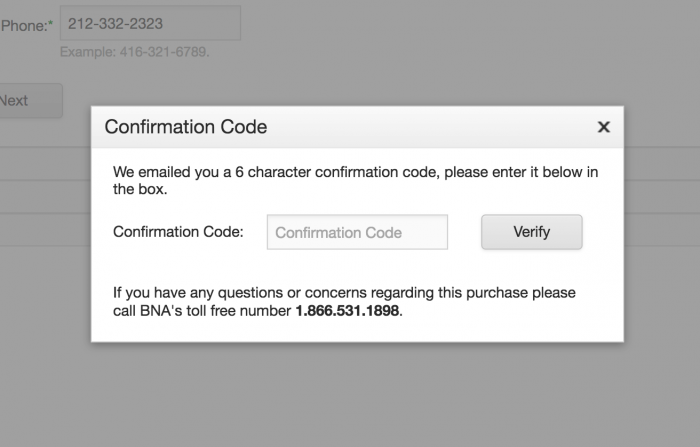 This portion is in order to authentic that you have entered a valid e-mail address. Why is this important? Because if for some reason we need to issue you a refund, the refund will be sent to you as an electronic check which you can print and deposit. This is what it looks like when you open the e-mail. The e-mail was sent to the e-mail address you entered in Step 3. Each confirmation codes is unique. Do not enter the one on this example as it will not work for your unique transaction. Where can you find what your Routing Number and Account number is? Simple, just pull out a check and all the information is on there. Here is an example of a sample check of where the information is located on most checks. This page will summarize the information you entered. If everything is accurate, click on “Buy Now” and the payment will be processed and only the amount shown on your invoice will be withdrawn from your checking account. For the worriers out there, no recurring payments can be made to anyone’s account with a physical check. 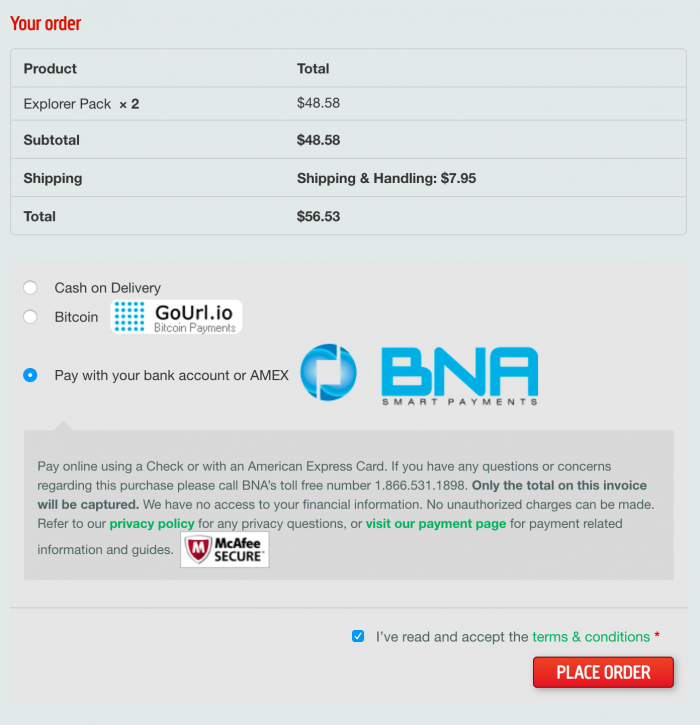 BNA Smart Pay will show up on your bank statement. No mention will be made to SalviaExtract.com or HRP, or anything relating to this site. Your privacy is our top concern. If you clicked on “Buy Now” and it says failed, that means you entered incorrect information. You can change the information by clicking on “Change” on either the billing details or the payment details. If you have any further questions please contact our payment solutions partner at 1.866.531.1898 or contact us.